I wasn’t going to make this post. I made these muffins over the weekend, on a whim, and had kind of less than stellar results. But because I am compelled to share everything, here is my latest kitchen failure. I still have some homemade pumpkin puree and am still looking for awesome things to put it in. I already tried it in oatmeal and in scones, so the next logical move was muffins. I’m on a bit of a muffin kick, so I was excited for these. I looked around for the perfect muffin recipe, and upon seeing this gem on Two Peas & Their Pod, I knew I had to make them. 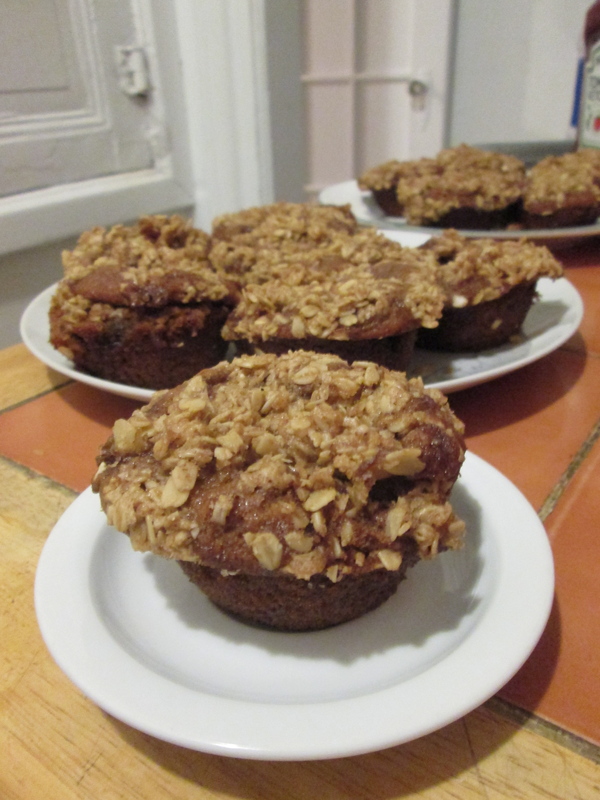 I decided on these muffins for two reasons: oat streusel and brown sugar filling. I love oatmeal, so that was a no brainer. And then the filling. THE FILLING. Who doesn’t love a baked goodie with a surprise in the center? No one, and anyone who says they hate fillings is basically a liar. Anyway, I made these babies with tender love and care, and was excited for the results. I watched them bake in the oven (through the glass, of course), waiting for time to be up so I can promptly stuff my face with a hot muffin. Here’s where my muffins went wrong. Realistically speaking, muffins are unfrosted cupcakes. Of course, cupcakes are usually found in paper liners. When I make muffins, I usually forgo the liners because most muffin recipes are moister than cupcakes and a large amount tends to stick to the liner. What’s the point of eating a muffin if half of it stays on the liner? NONE. There is no point. So, I opted against the liners. Big mistake. These muffins were so moist and fragile, I could barely get them out of the buttered pan unscathed. I stood in front of the muffin tins, hands sticky with muffin crumbs, feeling slightly defeated. I even popped them into the freezer for a couple of minutes to try to salvage at least one picture perfect one. That didn’t help me much, either. I let them cool completely, before I tried removing them. Even after completely cooled, it was a careful operation. The tops wanted to break off the muffin, mostly because part of it stayed stuck on the top of the muffin tin (and because I may have over streuseled. Is that even a word? It should be). When I did manage to unstick the muffin top off the pan, and my paring knife in the muffin well to coax the muffin out, it wanted to disintegrate in my hands because of the brown sugar filling. It was still soft and damp, and it wanted to tear the muffin apart. I fought the hard fight and managed to get all 14 out, even though I had some minor casualties. The muffins were ridiculously moist and sweet. You don’t really taste the pumpkin, which is fine if you have picky family members who think pumpkin anything is too mushy (ahem, dad), but the warmth and feel of anything pumpkin related is still there. 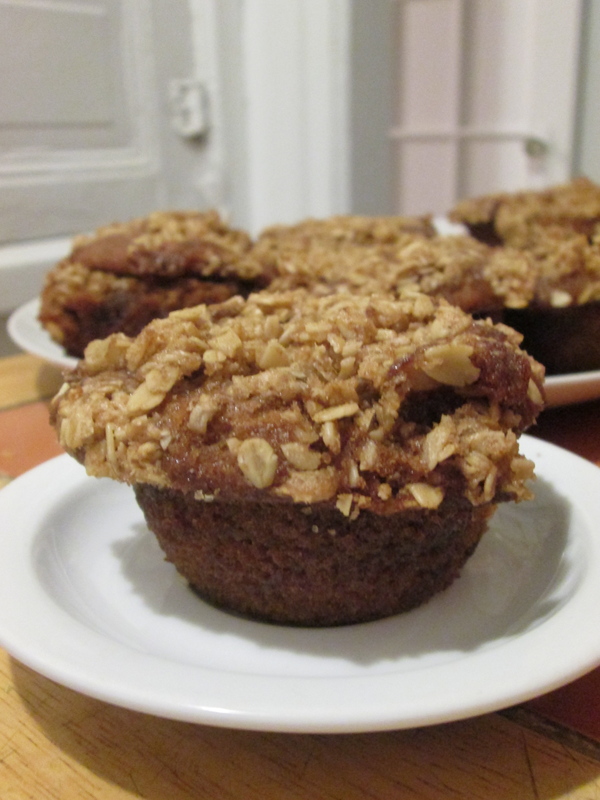 The brown sugar filling was a nice and sweet surprise that guaranteed the muffin would remain moist. Finally, the oatmeal streusel. OMG it tasted like a cookie. It felt like three desserts in one, which is a-okay in my book. Despite my novice fails, a muffin is the perfect vehicle for pumpkin. Just remember that some muffins do require a liner, despite their unfrosted appearance. Preheat the oven to 350 degrees F. Line two muffin tins with paper liners or spray with cooking spray. Set aside. In a large bowl, whisk together sugar, oil, water, pumpkin, egg, and vanilla extract. Whisk until smooth and combined. Slowly stir in the flour mixture. Mix until ingredients are combined. For the brown sugar cinnamon filling: in a small bowl, mix the brown sugar and cinnamon together. Set aside. For the streusel topping: in a small bowl mix together the oats, flour, brown sugar, cinnamon, and nutmeg. Mix in the butter with your hands until the mixture is crumbly. Fill muffin cups half way full with the pumpkin batter. Sprinkle the brown sugar cinnamon filling over each half filled muffin cup. Fill the muffins cups with the remaining batter. Top each muffin with streusel topping. Bake for 17-20 minutes or until a toothpick comes out clean. Remove pans from oven and cool on a wire rack. Remove muffins from tins and enjoy. Use the liners. For the love of all that’s tasty and delicious, USE THE LINERS. Don’t do as I did, do as I say. It’ll make for easy removal, even if you may have to lick the liner to get the rest of your muffin. I used about a 1/4 less of the brown sugar for the filling, may even go lower next time. You can use as much as a full cup of brown sugar. If using homemade pumpkin puree, I’d forgo the water in the recipe (which was something I should’ve done) because canned pumpkin puree is dryer than the fresh stuff. I used one extra large egg, as it’s what I have at home. The original recipe calls for two eggs. Large eggs are standard in most recipes, so assume that you’ll need large eggs unless stated otherwise. For more on the egg thing, read this post from Joy the Baker. Before baking, I would suggest sprinkling a little bit of kosher or sea salt on top of the streusel. The sprinkle of salt will probably enhance the overall flavor of the muffin, as well as the streusel. I will do this next time, as this sounds freakin’ delicious.